While some reference works on jugglers from the Vaudeville era to the present exist, to my knowledge no one has attempted a rigorous investigation into the history of juggling prior to Vaudeville. This article summarizes material I have found during some years of casual research in this area, and some of my own analyses and conclusions. This is not intended as a definitive study, but will I hope provide a useful starting point for anyone interested in pursuing thorough research. This paper ends with a bibliography of articles and books that specifically discuss medieval or earlier juggling. Though short, compiling this bibliography proved extremely difficult. Using computer searches for finding juggling publications is almost impossible, because the very vast majority of published material containing the word juggle does so only as a metaphor for coping with many problems at once, instead of being literally about juggling. Most of the few references that really do concern juggling then turn out to be either fiction or instructional materials. Almost all of the references I ultimately did find were in places that are too obscure to be found by computer searches. A wealth of information can be found on topics related to juggling history. Hundreds of books and articles can be found concerning jesters, jongleurs, fools, clowns, magic, etc. These generally will mention juggling only in passing, if at all. Some histories of ball play and ball games, while not directly about juggling, may be useful for descriptions of balls that jugglers might have used. The American Heritage Dictionary defines juggle first as "To keep (two or more) objects in the air at one time by alternately tossing and catching them," and second, to have difficulty holding; balance insecurely. The first definition is known as toss juggling, while the second hints at the very broad spectrum of object manipulations that can be said to comprise juggling. This paper focuses on juggling in the narrow sense of toss juggling. The objects that are juggled are called props. The paths followed by the props while juggling is called the pattern. The commonest pattern used today for juggling is the cascade, in which the balls or other props follow a horizontal figure eight pattern above the hands. Other common patterns are columns and fountains, where each hand throws balls almost straight up and each ball is caught in the same hand that throws it, and the shower pattern in which every ball is thrown in a high arc from the right hand to the left (or vice versa) and then quickly passed off with a very low throw from the left to the right (or vice versa). For any number of objects greater than two, the shower pattern is much more difficult than the cascade or fountain. One way to simplify the juggling of many objects is what modern jugglers call "multiplexing." In multiplexing the props are caught individually as in ordinary toss juggling, but two or more props are gathered in a hand sequentially and then are all thrown at the same time. It is also easier to bounce juggle (in which balls are bounced off the floor instead of thrown in the air) large numbers of balls than to toss juggle them, because the energy requirements are considerably lower, e.g., the first robot juggling machine bounce juggled (see ). 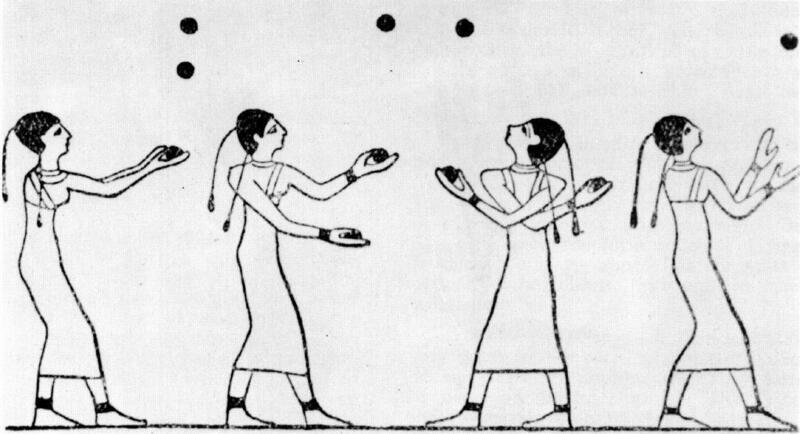 The earliest known depiction of toss juggling is Egyptian, from the 15th Beni Hassan tomb of an unknown prince, dating from the middle kingdom period of about 1994-1781 B.C. . 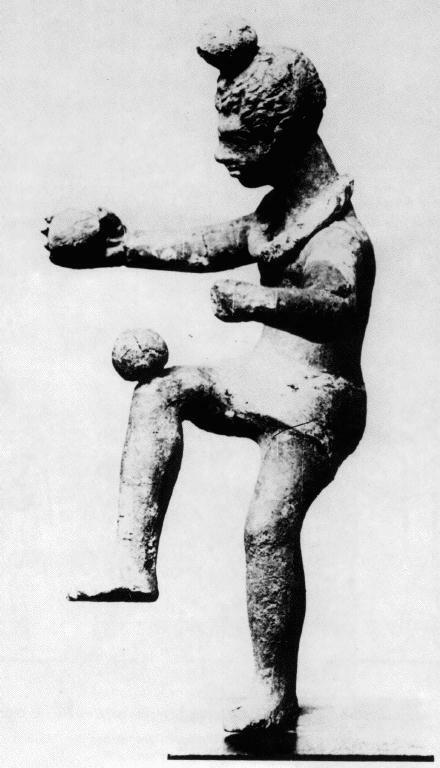 The Staatliche Museen zu Berlin has a Terra Cotta Statue from the time of Ptolomaer of ancient Thebes, about 200 B.C., of a man with balls balanced on different parts of his body , . Some pictures of jugglers appear in various medieval illuminated manuscripts described in the references below, most notably . See  also. The earliest representations of juggling - Egyptian, Greek and Roman . An old paper of mine, , discusses the tendency in illustrations to draw objects being juggled in a single arc over the jugglers head, while the juggler holds his arms far out to either side of his or her (usually his) body, and generally looks straight ahead instead of up at the pattern. 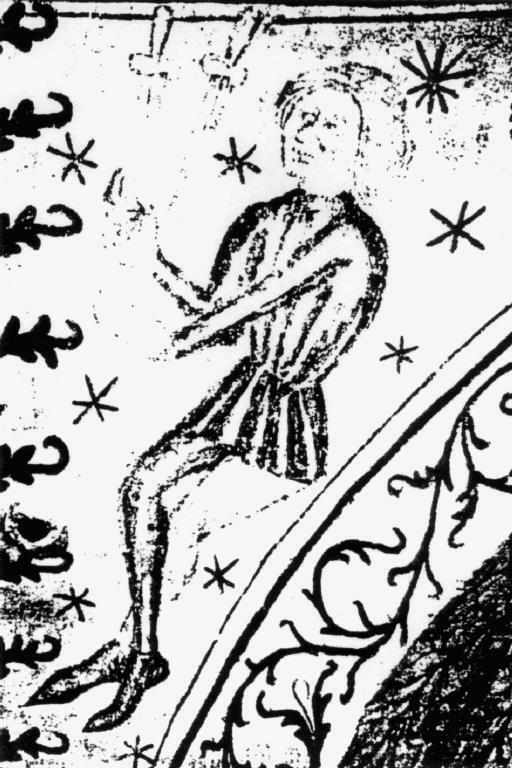 This drawing is probably intended to represent a shower, though a correct representation of a shower would have the hands and arms much closer together, eyes directed toward the top of the pattern, and either far fewer objects, or an arc much taller relative to the width. This now ubiquitous misrepresentation of juggling as a single arc of props over widely separated hands was less common in the past. One historical example is from an eighteenth century french woodcut, which is reproduced in . Even Scientific American once got this wrong; The text in the January 1, 1898 issue of Scientific American correctly describes how a trick blindfold is made, but the accompanying picture of a blindfolded juggler shows a six object shower pattern that would be physically impossible to do at the height and width shown. A modern article on the science of juggling in that magazine, , does not suffer from this problem. Earliest example I've found of the common modern inaccurate representation of juggling as a single arc of props over widely separated hands, from an 18th century French wood cut . 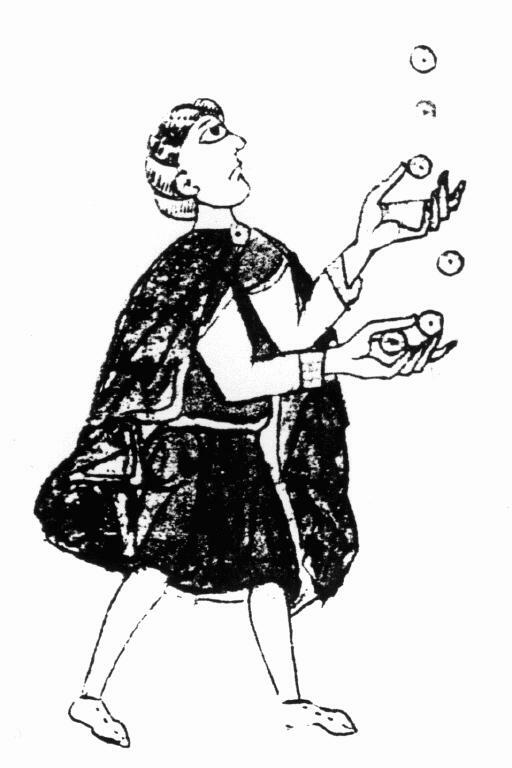 Generally, historical renditions properly show the juggler's hands relatively close together (one to two feet apart is normal). In these pictures the objects are usually drawn in straight lines above the hands (consistent with fountains, columns, and some forms of multiplexes), or scattered in a cloud above the hands, both of which are closer to real juggling than a single very low, very wide arc. Both modern and historical juggling pictures that show more than three or four objects tend to show the objects being juggled lower and clustered closer together than is physically possible, other than by multiplexing. In addition to pictures, written references to juggling are also quite old. The Chinese Book of Lie Zi, written during the Warring States Period (475-221 B.C.) and attributed to Lie Yukou, describes a Lan Zi from the state of Song in the Spring and Autumn Period (770-476 B.C.) that juggled seven swords . The Tractate Sukkah of the Talmud says that Rabbi Shimon ben Gamaliel could, "take eight flaming torches and throw them in the air, and catch one and throw one and they did not touch one another." The story "Tain Bo Cuailnge,"  describes the 5th century AD Irish hero Cuchulainn juggling nine apples. A few centuries later Tulchinne, the royal buffoon of king Conaire, is described in "The Destruction of Da Derga's Hostel," as juggling nine swords, nine silver shields, and nine balls of gold (see ). Norse mythology includes juggling in Snorri Sturluson's (1179? - 1241) Edda , where in the first part (Gylfaginning) he writes, "In the doorway of the hall, Gylfi saw a man juggling with knives, keeping seven in the air at a time." The number of objects being juggled in these accounts are improbable but not quite impossibly large. Old drawings are more realistic, with rarely more than six objects depicted. Current world juggling records are 12 rings, 11 balls, and 8 clubs. These records are for "flashes," where each object is thrown and caught at least once. World records have not been set for bounce or multiplex juggles, but it is undoubtably the case that higher numbers would be possible using either of these techniques. Jugglers Illuminated - the one on the right could be multiplexing (, , , and British Museum). It is extremely difficult for nonjugglers to count more than about 5 objects being juggled, so these early scribes could easily have been misled, or they may have purposely exaggerated to improve their story. Alternatively, the jugglers reported to be juggling 7 to 9 objects may have multiplexed them, though the above description of Rabbi Gamaliel's juggling would seem to be specifically ruling out multiplexing. The illustration here from the British Museum looks very much like a multiplex juggle. I have never seen any picture or description of bounce juggling prior to the modern era. From both early texts and pictures it is clear that the commonest props used for juggling were balls, knives, and torches. Ziethen and Allen  give the following information, though they do not provide any references to primary sources: A Roman, Tagatus Ursus (53-117 A.D.) claimed on his grave inscription to have been the first to juggle with glass balls (the use of glass or acrylic balls for juggling has recently been popularized by Michael Moschen. 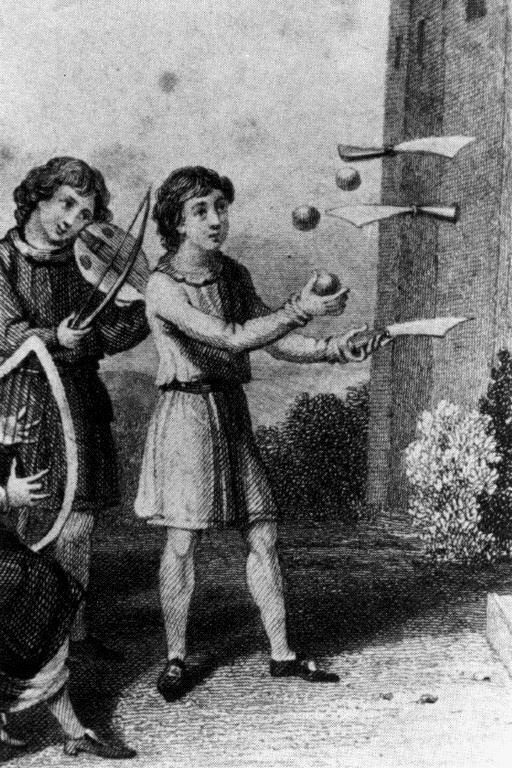 See, e.g., the August 1995 issue of Smithsonian magazine) Pierre Gringoire (1475-1538) was known as the "King of Jugglers." In 1528 The emperor of Hindustan described jugglers with wooden rings. Also in 1528, Christoph Weiditz made drawings of Aztec jugglers. 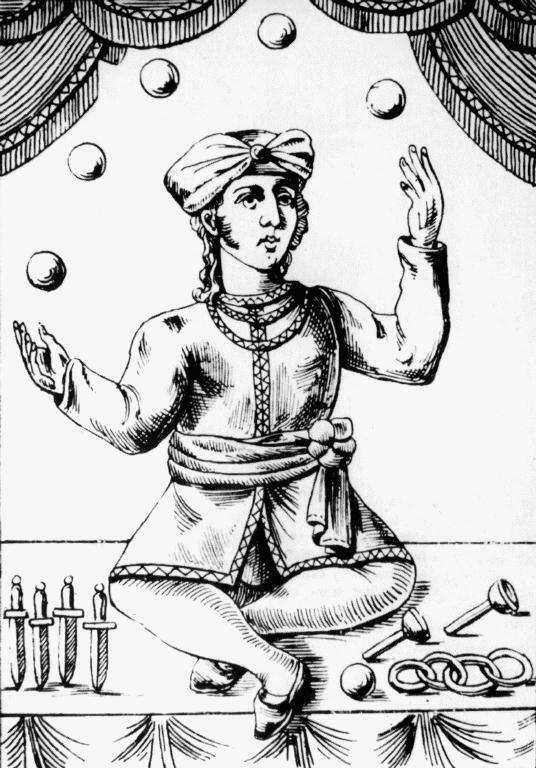 In 1680, the Town Council of Nuremberg hired a "ball-master" who juggled and taught others juggling and other skills. The article by Fletcher  is very well documented with a fine set of original references. It includes descriptions of juggling in Ireland from the tenth century and earlier, including the above reference to Tulchinne and to laws (from the "Lebor Aicle") that describe required compensation of audience members who are harmed by juggler's mistakes. Fletcher also documents how psalter illustrations of the triumphal carrying of the Ark from of the Covenant into Jerusalem evolved from the eighth to eleventh century to include jugglers and "more modern" departures from the biblical description which includes only singers, cymbals, and trumpet. Finally, Fletcher argues that similarities between Celtic and Anglo-Saxon juggling (e.g., both use balls and knives) provide evidence for cultural links between the two dating before the tenth and eleventh centuries. In addition to references to juggling in the 1800's and 1900's, the Truzzi articles  and  describe apparently indigenous juggling on Pacific islands and among native Americans. In particular, Truzzi provides historical descriptions of young girls juggling limes, gourds, or tui tui nuts (in a shower pattern) on the island of Tonga, a hobby which persists there to the present day. The earliest reference is in 1774 by George Forster, aboard captain Cook's second Pacific voyage. In Japan, young girls play an old game called Otedama, which includes singing rhymes and juggling balls, again in a shower pattern. 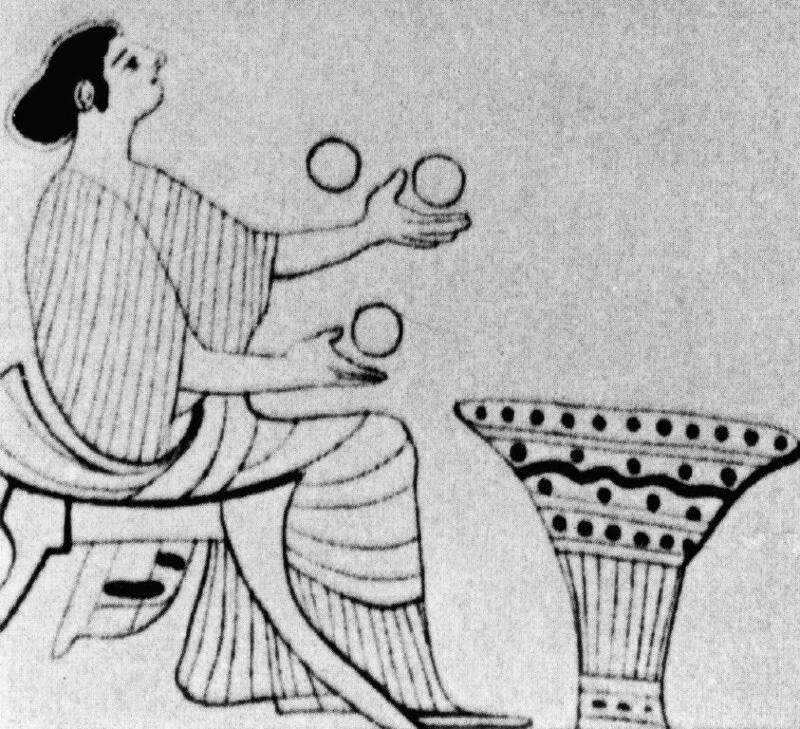 While most historical written records and medieval illuminations have men juggling, the first records of jugglers in Egypt, Greece, and the Pacific Islands are women. The later European jesters and more recently circus and vaudeville jugglers are predominantly but not exclusively men. There is one famous story of a fictional medieval juggler, usually known either as, "The Juggler of Notre Dame," or "The Juggler of our Lady". The story has many variants, and has been made into books, plays, and even an opera. A nice modern version is the children's book, "The Clown of God," by Tomie de Paola, Harcourt Brace, 1978. The story concerns a poor juggler who, having no other gift to give, juggles before a statue of the Virgin Mary holding baby Jesus. The statue is then miraculously transformed (e.g., Jesus or Mary smile or catch one of the balls). Historically, the words used to describe juggling lump it together with other activities that vary by time and place. 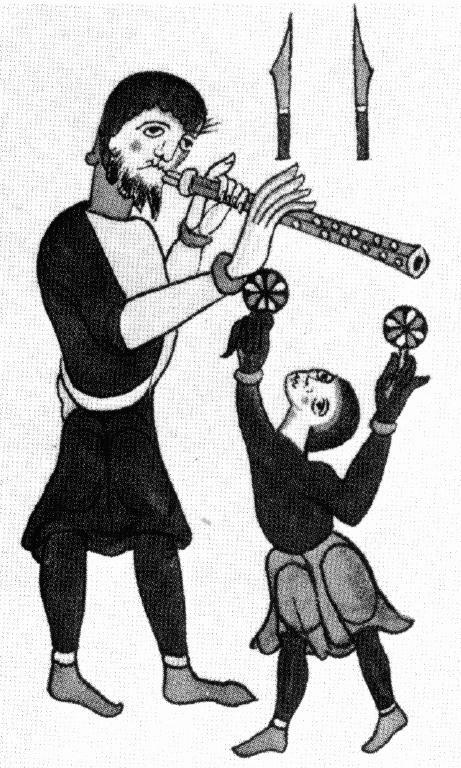 The Medieval Joculatores and later Jongleurs and Jesters were primarily singers or other kinds of entertainers. Similarly, among the Celts a juggler could be a clesamnach (a performer of tricks or feats) or a drLth (fool). Later, the French Bateleur would do juggling, tumbling, and magic tricks. Bateleur is also the name for the Tarot card that is known as the Magician in English. The words prestidigitation and legerdemain also group juggling with magic (see, e.g., . As a result of circuses, juggling is now most commonly associated with clowning. Modern definitions of juggling are somewhat inconsistent. As mentioned above, the American heritage dictionary describes juggling as I've used the term. However, in the Shorter Oxford English dictionary, juggle is defined primarily as buffoonery, trickery, and deceit, with a description of toss juggling only occurring late in the third definition. On the other hand, Oxford lists "jugglers tricks" in the derivation of the first definition of the word "prestige." Neither dictionary definition fits the commonest modern usage of the word, which is exemplified by sentences like, "juggling a family and a career." Difficulty in categorizing juggling is not unique to Romance languages. For example, Japanese does not have a word for toss juggling, though it does have tejina (which means magic, though the Kanji for it is a hand plus three objects), kyokugei (unusual performance, generally including acrobatics and object manipulation), daikagura (which includes balancing and manipulations with tops, fans, and parasols, but not toss juggling) and Otedama (literally meaning hand plus ball), a little girl's juggling game similar to jacks. The citations to "Jugglers World" below refer to Jugglers World magazine, which is published quarterly by the International Juggler's Association, PO Box 218, Montague, MA 01351. Jugglers World is edited by Bill Giduz, PO Box 443, Davidson, NC 28036. Beek, Peter J. and Arthur Lewbel, "The Science of Juggling," Scientific American, November, 1995, pp. 92-97. Claflin, Edward and Jeff Sheridan (1977), "Street Magic - An Illustrated History of Wandering Magicians and Their Conjuring Arts" Dolphin Books, Doubleday and Co., 1977, ISBN 0-385-12864-9. Deals with street performers in general, with many old drawings. Fletcher, Alan J. (1990), "Jugglers Celtic and Anglo-Saxon," Theatre Notebook, vol. 44, # 1, pp. 2-18. Many good historical references to juggling in England and Ireland. Gillen, Billy (1990), "Tarot Hides Mystery of the Juggling `Bateleur'," Juggler's World, Spring 1990, pp. 18-19. History of the Juggler (or Magician) tarot card. Gillen, Billy (1990), "Remember the Force Hassan! Delving Deeper into Juggling Hieroglyphics," Juggler's World, Summer 1986, pp. 9-10. Juggling in ancient Egyptian carvings. Includes some references to anthropologists who have written generally about ball play in Ancient Egypt. Lewbel, Arthur (1987), "Juggling and the Subjective Records of Physical Skills," Tournaments Illuminated, Summer 1987, #83 pp. 25-26 (under the pseudonym LeifTameon Carlsefnisson). Speculates on the difficulty of recreating historical physical skills from subjective records, using as an example modern inaccurate drawings of juggling. Rid, Samuel (1612), "The Art of Iugling or Legerdemaine," Govt. Doc. Collection Microfilm, Reel 971, Cat#21027, Pr 1121.U6, MiU F63-378). One version of Snorri Sturluson's Edda is "Edda Snorra Sturlusonar. Edda: part 1. New York: Oxford University Press, 1980." Many different editions and translations are available. Truzzi, Marcello (1974), "Notes Toward a History of Juggling," Bandwagon, vol. 18 (March-April), pp. 4-7. Truzzi, Marcello (1979), "On Keeping Things Up in the Air," Natural History, pp. 44-55. An expanded version of the Bandwagon article above. Mostly deals with 19th and 20th century jugglers, but has some older material. Ziethen, Karl-Heinz (1981-82), 4000 years of Juggling, vol. 1 and 2. A Large, privately printed book full of rare photos of jugglers (mostly vaudeville). Ziethen, Karl-Heinz (1985), "Jonglierkunst Im Wandel Der Zeiten," Berlin. A condensed version of "4000 years" with German Text. Privately printed. Ziethen, Karl-Heinz and Andrew Allen (1985), Juggling - The Art and its Artists, published by Werner Rausch & Werner Luft Inc.: Berlin (ISBN 3-9801140-1-5). Another collection of photos, this one accompanied by brief biographies, mostly 19th and 20th century. Includes an Egyptian, an early Greek, and two medieval pictures of jugglers. I have not found an original reference to The Book of Lie Zi. Ben Schoenberg (who runs the Serious Juggling Company mentioned above) says he has seen a modern book by Fu Qifeng called "Chinese Acrobats Through the Ages," which discusses The Book of Lie Zi. One translation of "Tain Bo Cuailnge," is by Thomas Kinsella, Oxford University Press (1970). COPYRIGHT NOTICE: This material should not be copied without permission of the author. Please cite this article as a source if you use any of this material, or if you quote portions of it. Some of this material has been submitted for publication in Jugglers World magazine and in Tournaments Illuminated magazine. I would be very interested in hearing about uses that are made of this material and of other historical references to juggling. Thank you.